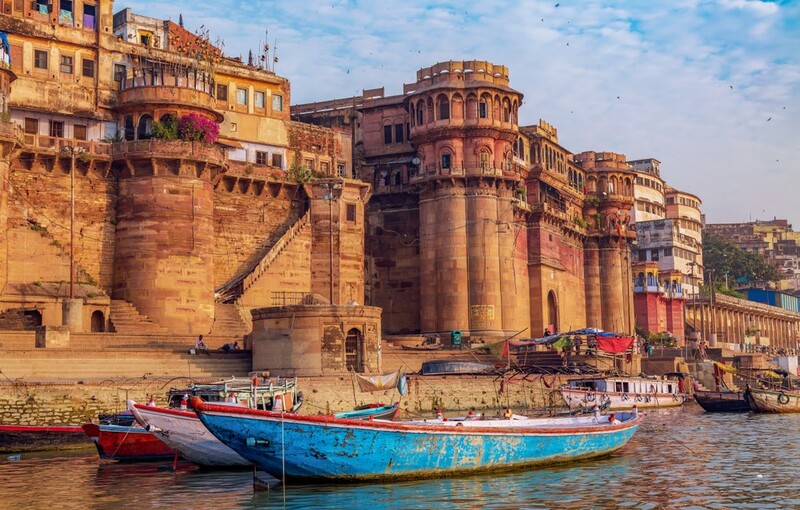 A bustling and lively place, Dashashwamedh Ghat exists amongst the hurried movements of boat owners, shopkeepers, silk sellers and the people of Varanasi. The Ganga Aarti ceremony takes place every evening. Young pandits light lamps, blow conch shells, wave incense and chant songs. Hindus believe that during the ritual the lamps gather the power of the goddess, Ganga. Although this is a lively ceremony, it is performed and watched with great respect. Don’t leave Varanasi without witnessing this incredible service! Considered one of the oldest and most blessed ghats, Manikarnika Ghat is particularly meaningful to Hindus. Cremation at this auspicious site offers salvation and eternal peace. A powerful ritual to witness, it is a sombre and humbling experience. Here, gain a unique insight into Hinduism and the complex and unique funeral process. Rise early and take part in a truly divine ritual– yoga at sunrise. Each morning hundreds gather to take part and practice as the sun rises. Ensure this unforgettable experience is part of your Varanasi itinerary. Nothing beats yoga with a breathtaking view of the Ganges! An important Buddhist pilgrimage destination, Sarnath is where Buddha first preached. A place with a great spiritual significance, it boasts a rich history. In 234 BC, the Emperor Ashoka erected breathtaking stupas and monasteries. Structures were built until the 11th century AD. It is one of the four key sites for Buddhists around the world. Today history, religion and nature converge, as it has now become a deer park. Ancient structures such as Dhamek Stupa, Chaukhandi Stupa and the Dharmarajika Stupa can still be seen. A truly unique place, nothing compares to wandering through ancient ruins whilst deer graze peacefully around you. A stunning architectural structure, Banaras Hindu University is recommended by our India Tours and Travel Specialist, Sean. Established in 1916, the campus spans an area of 5km squared and has produced many prominent artists, scholars and scientists. A sanctuary away from the hustle and bustle of the city, the university also houses a museum called the Bharat Kala Bhavan. Here you can view paintings, textiles, jewellery and palm-leaf manuscripts. Wander around this impressive, beautiful institution and learn of its rich history. Known as one of the holiest cities, Varanasi is also one of the busiest cities! Ensure you set aside a morning or an afternoon to wander through the streets– explore the meandering alleys and stroll by the ghats. Be prepared for an assault on the senses, in the best possible way! Use this time to seek out sumptuous silks that Varanasi is famous for or revel in the aromas of the spice market. Take the opportunity to taste some local delicacies, or live life in the fast lane in a rickshaw. Varanasi has a lot to offer and nothing beats getting in amongst the action of this lively city! An iconic experience of Varanasi, a boat ride at dawn is a must. Rise as the rest of the city stirs and make your way down to one of the ghats. Learn about the history of Varanasi and witness the morning rituals that occur along the banks of the Ganges. Enjoy this almost mystical experience as the morning fog parts, taking a peaceful moment before this bustling city comes to life!